Kleefeld on Comics: On -isms: Watermelon? Really? So you've heard about Jerry Holbert's "watermelon" cartoon, right? 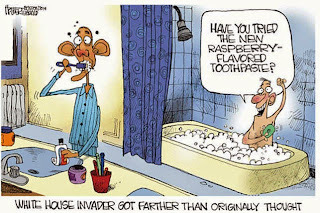 Where, in poking fun at the recent White House security gaff, Holbert drew a stranger in President Obama's bathtub. In theory, it's suggesting that security is so weak that any random person could get ready access to what should be the most private place for the President. Which is a decent enough joke, but then Holbert went an extra step by having this stranger initiating a conversation with the President about watermelon flavored toothpaste. And to no one's suprise (except, apparently, Holbert himself and the editors at The Boston Herald who employ him) people saw that as a racist commentary. Holbert claims innocence on the grounds that he was ignorant of any racist connotations from pairing a Black man with watermelons. It's plausible, I suppose, but I'm highly skeptical. First, the stranger's dialogue is irrelevant to the joke. The gag is just the surprise that Obama finds a stranger in the absolutely last place he would expect. There are any number of ways Obama could've come across this person. But even assuming you want to keep the exact same art, you can have the bather say ANYTHING and the joke still works. "Can you pass the shampoo?" "So when do they stop serving breakfast in this joint?" "Looks like it'll be a nice day out." He needs to say something so that Obama realizes someone is in the room with him, despite his back being turned. But the dialogue can be about literally anything, and it impacts the joke absolutely not at all. Holbert had an infinite number of options to choose from, and he opted for watermelon toothpaste. But here's the real reason I don't buy Holbert's excuse: he's a polticial cartoonist. The job description of a political cartoonist hasn't changed in a century. They poke fun at political figures and situations using illustrations, and rely on visual analogies and iconography to get their points across. Their job is to know (and thus be able to draw) symbols. If you draw a white dove, that is a symbol for peace. If you draw a robed figure wielding a scythe, that is a symbol for death. Political cartoonists (and, for that matter, all cartoonists) deal with symbols ALL THE TIME. That is the very heart of their job. To convey ideas to readers using symbols. There is no better expert on symbols than a talented political cartoonist. And for a political cartoonist to NOT realize the symbolism of putting a Black man in the context of watermelons? That says to me that the cartoonist is maybe not very good at knowing symbols. And if you're not very good at knowing symbols, maybe you shouldn't be trying to make a career drawing them. Either that, or you knew damn well what you were doing and were hoping that no one would notice. In which case, you'd be a racist fucktard. Either way, as much as I don't like that so many cartoonists have been let go from newspapers, this might be one instance where it's justified.